Tired of walking around the neighborhood? Bored with the same old route taken by every single charity walk and fun walk/run in your area? Tired of gaining weight on every vacation? Time to hit the road and find new places to walk on a walking vacation. How do you take a walking vacation? Set both your training and vacation goal at the same time - choose a special major walking event in an interesting locale. Marathon: It takes six to nine months to properly train for a marathon. Choose a walker-friendly marathon in a fun locale and make it your destination as well as your training goal. Multi-day Walks: The IML International Walking Association (formerly International Marching League) hosts one sanctioned multi-day walk in each of its member countries. These events require a minimum distance of 20 kilometers each day for 2-4 days to earn the IML stamp. Shorter distances may be available. The Avon Walk for Breast Cancer or the Komen Breast Cancer 3-Day Walks are charity events held in several cities in the USA requiring approximately 13-26 miles a day for 2-3, with participants raising $1800 for breast cancer. Arrive a couple of days in advance of the event to get used to any time change or difference in climate and altitude. If you drive yourself a long distance to attend the event, give yourself a day to recover from the muscle-tightening effects of driving. If you fly, be sure to drink enough water to rehydrate yourself - flying takes a lot of fluid from your body. Avoid alcohol on the day before the event. Do not change your diet - eat what you have been eating in training as much as possible. Wait until after the event to sample the local specialties. Give yourself a full day after the event to recover before doing any heavy sightseeing or returning home. Marathons generally are in the $50 US price range for registration, usually including the medal, certificate, and a t-shirt. International Marching League events are generally in the $15 - $20 US price range, which includes the medal and certificates. Any t-shirts or other memorabilia are extra. Free travel: Walk a marathon for charity or the Breast Cancer 3-Day Walk to get perks such as free training, airfare, lodging, and meals. You must raise a certain amount of donations in return. 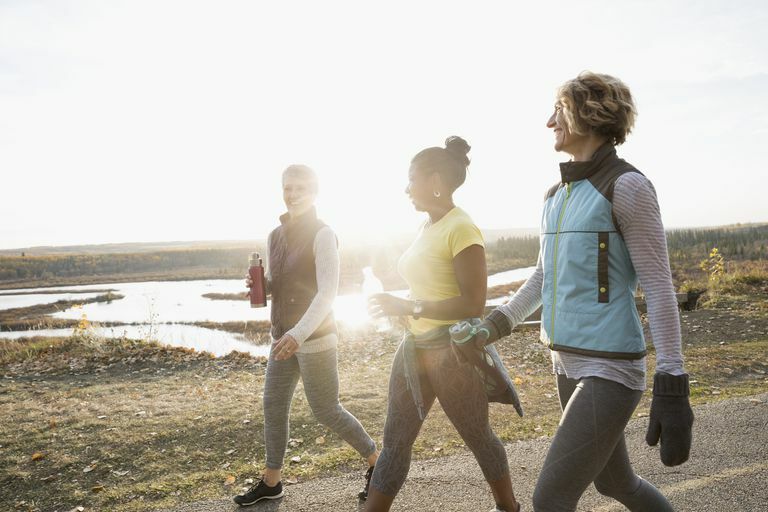 A walking festival or walking convention will offer many walking events, but they do not require the training needed for a marathon or multi-day walk. Instead, you can concentrate on enjoying locale and meeting walking friends at the walks, workshops, and socials. These festivals are open to everyone, member or non-member. AVA Convention: Every two years the clubs of the American Volkssport Association's Convention brings together walkers from around the world for nine days of walking and fun. The walking events are open to anyone, and anyone may attend the full convention to also enjoy renowned speakers, workshops, and socials. AVA Walking Festivals: The regions and local clubs of the AVA host special walking events and festivals throughout the year. Walks offered during the festivals are a standard 10-kilometer distance (6.2 miles), with shorter and longer trails also available. CVF Annual General Meeting: The Canadians spend a long weekend each year conducting their volkssport association business and enjoying walks, workshops, and socials. Wanderwochen in Germany: Walking weeks. IVV Olympiad: Held every two years, this international walking festival draws walkers from around the world for walking, biking, and swimming. You do not need to be a member or a club representative to attend these festivals and conventions, the general public is welcome. You can usually participate in the walking event separately from the conventions or festivals themselves. These festivals are a great way to make new walking friends from around the world. The walkers attending usually know what other walking festivals and walking destinations are the best -some come to research your next walking vacation. AVA events are inexpensive. Walkers can often simply walk for free or $1, with optional event awards in the $5-$10 range for each walk. Convention registration: For local festivals, there is usually no fee or a small fee of under $15, with separate fees for any barbecues or banquets. For the national conventions, fees are generally in the $50-150 range and include some socials or lunches in addition to workshops and speakers. Travel arrangements to the festivals are generally made on your own. Lodging: the festivals will often have a headquarters hotel plus a list of many options in the local area, including RV parks and camping. As you make walking friends, ask about homestays in the area to which you are traveling. Leave the planning to the professionals and book a walking tour or trek with an outfitter. Small and large companies offer adventure travel vacations that include walking or hiking in great locales around the world. Itineraries may be as short as an afternoon or as long as a month. Many companies offer all-inclusive packages including land travel during the tour, some meals, walking event entry fees and park and museum fees, etc. When choosing a walking tour company, look for one that matches the style of vacation you want. See it all: Some companies offer very detailed itineraries for the group, with every minute planned. On such a tour you must usually stay with the group except during designated free times. Walks may be guided and assisted by local historians or naturalists to help you learn about the areas in which you are walking. Relax and enjoy: Other companies have a much more free-form style. They get you to the destination, give you maps for walking opportunities, then let you enjoy yourself while they remain available for any questions or problems. Group size: Ask about the size of groups that will be on the tour and the number of tour leaders and assistants. Don't be just one of the herd. Accommodations: Ask about the quality of the hotels used and meals to make sure it will match your price range as well as your comfort level. Walk distance and difficulty: How far will you be walking each day? What is the terrain -- city vs. forest, flat vs. mountains? Treks and Hikes: A tour billed as a hiking tour or trekking tour will usually be in natural terrain and may involve camping rather than using hotels. Llama packing is a great way to visit the high country without carrying a backpack. Tour Leader Experience: Ask about the tour leaders and assistants -- how long have they been doing walking tours? Company Experience: How long has the company been in existence? Has it offered the tour before? How familiar are they with the locale to be offering a walking tour there? Clientele: Ask about the typical group - ages, sexes, abilities. Match yourself as well as possible to the type of clients on the tour. Roommates: Some tours will match you up with a roommate if you are traveling alone, upon your request. A guided walking tour including lodging and land transportation will run from $80 to $200 a day per person (double occupancy). Extra is usually charged for those who want a single occupancy room. Airfare often is not included, although the tour operator may be able to secure a good fare for you from your home airport. You can often get a discount by recruiting friends, family, or club members to take the same tour. For the independent traveler who doesn't want to be trapped in a crowd at a walking event or hustled into the bus on a tour, planning your own walking vacation is a great option. IVV walking clubs in the US, Canada, Britain, and many European countries have thousands of self-guided permanent trails. Walkers arrive at the start point, register, take a map and enjoy the trail, which often includes the highlights of the city, town, park or area. These are a great way to spice up a visit to any location, or you can plan your entire vacation around them. I count my AAA membership's biggest perk the free maps and guidebooks. With them, I can plan my own itinerary or avail myself of their free trip planning services. When planning a Southwest walking trip last fall, a single stop at AAA ensured we had hotels booked, a route planned and mapped, and plenty of ideas for where to walk. Don't overdo it: Be sane in your planning, only plan for walking distances for which you have trained and conditioned yourself. Build in rest days: Plan a rest day every third day where you do the only light walking and have time to catch up on laundry and postcards home. This will allow your muscles to repair so you have the energy for the rest of the trip. Watch the watch: Build in enough time to get to your destination and enjoy the walk while the major sightseeing attractions are open. Note opening and closing times and know when to avoid the heat of the day. Courtesy: Self-guided walk start points need extra courtesy, please allow them to serve their regular customers before assisting you. When possible, avail yourself of their services rather than being an "ugly walker." Carry water and snacks: You must plan for your own comfort on self-guided trails. Footwear: Plan for the terrain to decide if you need your regular walking shoes (pavement and roads) or trail shoes/boots (natural trails). For after the walk, a second pair of comfortable shoes or sandals will give your feet a breather. Socks: Take a minimum of three pairs of socks to allow for changing, washing, and drying time. Underwear: Again, a minimum of three changes to allow for washing and drying. Women should also consider three sports bras. Shorts: A pair of shorts can be worn walking and can double for swimming. If you plan to walk in the shorts and in warmer weather, take along two pairs. Pants: Choose a lightweight weave of cotton or cotton/poly that dries quickly. A single pair is fine for warm climates, two pairs if traveling to moderate or cool climates or plan to wear the pants while walking. Shirts: Coolmax shirts, both long sleeved and short sleeved dry quickly when washed. For a walking vacation, take along two short sleeved and one long sleeved. Jacket: Take a windproof water-resistant jacket with rain hood. Sweater or microfleece vest: This will provide the insulating layer when traveling to moderate or cooler climates. Hat: Protect your head from sunburn, or keep your body from cooling down with the right headgear. Sunglasses: I never leave home without them. Sunscreen: A walker's essential to prevent sunburn and skin cancer. Bug repellent: Know where you are going and take along bug stuff if needed. Maps: Know where you are going, or where you are supposed to be. Pack: Choose a backpack or hip pack to match the distance you will be walking and your needs along the way. Try it out before your trip on walks of similar length to make sure it works well for you. Water bottle: It is wise to take your own water along on your daily walks.